The Envirograf® TJ Grille offers full fire and smoke protection for openings in walls, ceilings and fire doors, or at the entry point of ventilation ducting. Automatically seals off in a fire and is available with a variety of resetting options. The grille is fitted into the aperture and screwed to the wall, door or partition. The intumescent plate is screwed to the opposite side of the door, wall or partition to the main unit. This intumescent plate need not be fitted if the main unit is fitted in ventilation ducting. The plates can be supplied with open slots which allow viewing or louvered for non-viewing. This type is reset by pushing the internal plate back to its original position by means of pen or screwdriver. The plate is held open by an electro-magnet 24V 125mA. This type resets itself and has a permanent loading of 24V 125mA, with the solenoid to open the grille taking 24V 8A for 1 second. This type closes when the fire gets near the grille. At 55°C, a thermal link breaks and closes the shutter. This type closes when the fire gets near the grille. At 50°C to 65°C, the grille will close, but the spring returns to the open position after the fire is over. The grilles are supplied to be open normally and close up in a fire. However, all of these grille types can be made to be closed normally and to open in the event of a fire. Manual Reset and Automatic Reset grille options can be wired to a 24V alarm system. 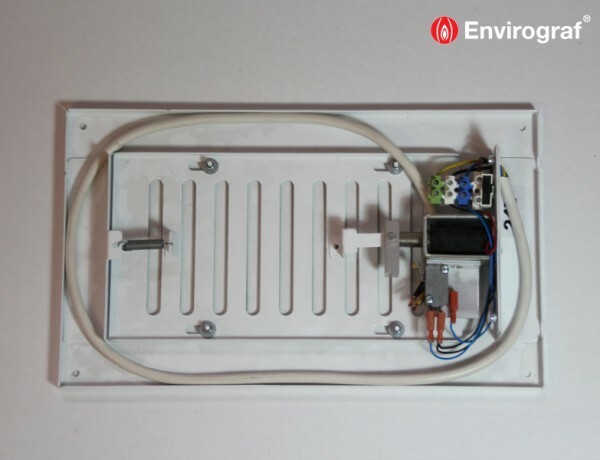 Alternatively, an Envirograf® mains to 24V control unit can be used to control up to 8 manual reset grilles or 3 automatic reset grilles. The control units have N O (normally open) and N C (normally closed) contacts to wire to the existing fire alarm or optional smoke detector. References shown for manual reset grilles only. Other grilles made to order. Standard finish is brown or white. Other colours may be available. State colour requirements clearly when ordering. Other sizes can be made to special order. Special custom sizes are non-returnable. Intumescent fire and smoke grilles tested to BS476 Part 20 (1987), achieving an integrity of 66 minutes. Also tested to BS476 Part 22 (1987), achieving an integrity of 73 minutes. Automatic closure grille tested to BS476 Parts 20 & 22, achieving 73 minutes fire protection.